Apple today announced the much-anticipated fourth-generation Apple TV at its "Hey Siri" media event in San Francisco, California. The new Apple TV was constructed on a foundation encompassing powerful hardware, a modern operating system, a new user experience with deep Siri integration, tools for developers, and most importantly, an App Store. 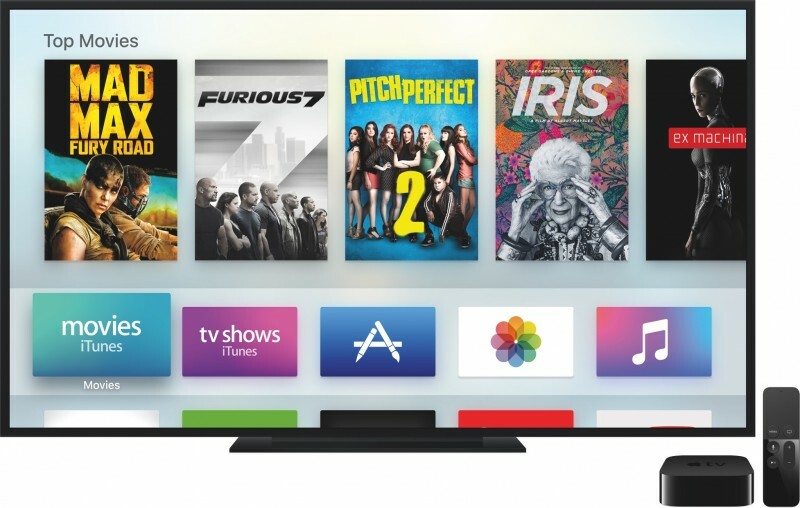 The Apple TV runs "tvOS," with a revamped iOS 9-style interface. 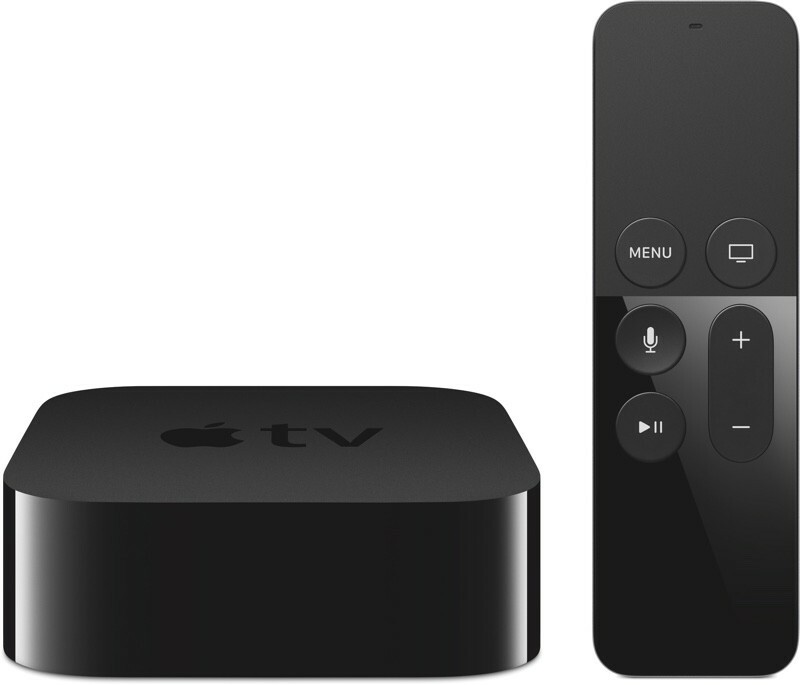 Design wise, it looks similar to the existing set-top box, but it's thicker and ships with a much more advanced touch-based remote that Apple's calling the "Siri Remote." The top of the remote includes a glass touch surface for swiping through content as you would on an iPhone, and there's a built-in button for calling up Siri. Siri integration is a key part of the new Apple TV interface, as it lets users ask Siri to bring up content. It's possible to search through multiple apps to find a TV show or movie, and at launch, supported apps include Netflix, iTunes, Hulu, HBO, and Showtime. Siri can answer questions about who's starring in a movie, bring up extraneous information like the weather outside, and ask Siri to replay parts of a movie that were missed or fast forward through content. For example, asking Siri "What did she say?" will rewind a movie 15 seconds and temporarily bring up subtitles. Siri has a wide range of commands that will make searching for content on the Apple TV simple. You can ask Siri to "Show me New Girl," or "Find the best funny movies from the '80s." 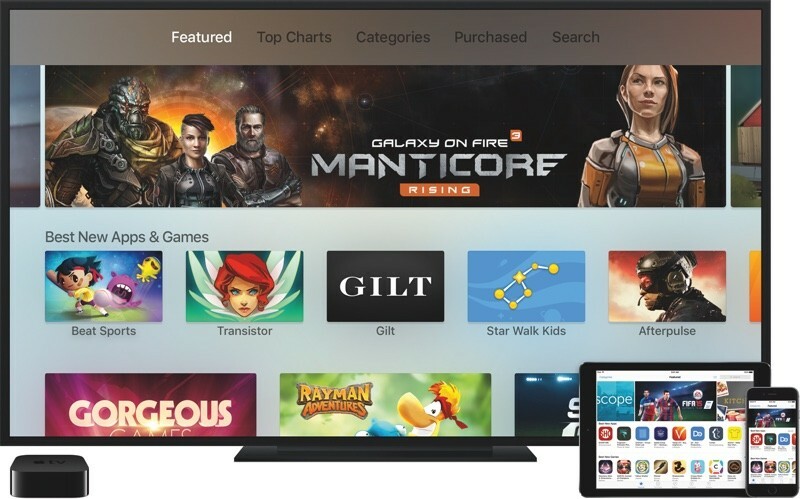 In addition to Siri integration, the other major software improvement to the Apple TV is a full App Store that includes games and popular apps. To facilitate gameplay on the Apple TV, the new remote includes an accelerometer and a gyroscope that can detect motion, much like a Wii Remote for the Nintendo Wii platform. On stage at the event, a multiplayer version of Crossy Road was demonstrated, with one player using the Apple TV remote and another player using an iPhone as an input device. The Apple TV will support both the iPhone and the iPod touch as an input device. Apple TV and iPhone games are going to be available universally, meaning you can start a game on the iPhone and then pick it up on the Apple TV. On stage, some upcoming apps for the Apple TV were shown off, including Netflix, HBONow, and Hulu. Game developers like Disney Interactive and Activision are working on games for the device that include "Disney Infinity 3.0" and "Guitar Hero." Harmonix is also developing a rhythm-based Wii Sports-style game that will be available exclusively on the Apple TV. The new Apple TV also comes with brand new screen savers featuring high definition footage shot by Apple. The screen savers show off cities in slow motion video and will showcase footage based on the time of day. Starting today, developers can access the tvOS SDK via a new Xcode beta to begin creating games and apps for the Apple TV. Internally, the Apple TV includes a 64-bit A8 chip, with support for key iOS technologies like Metal, GameKit, and UIKit, all of which will allow developers to bring console-quality games to the device. The Apple TV is available with either 32GB or 64GB of storage, which will be used for downloading apps, and it includes Bluetooth 4.0, 801.11ac Wi-Fi with MIMO and an IR receiver. The remote works over Bluetooth 4.0, so line of sight is not required, and its battery will last for up to three months on a single charge. Recharging the remote is done through a built-in Lightning connector. Plex app and integrate local media in search please. Is this the best they can do? What ever happened to all those rumours for a decade or more that the Apple Tv would be the best thing since... TV? is this it? Seriously? Is it? Agreed. I prefer your product which clearly is better. What was it again? Oh what, there's nothing? I am going to venture to say that 85% of the population does not have the internet ability to stream 4K without problems (either by choice of plan or a terrible connection like I have). In time, 4K makes sense, but for todays internet I don't see an issue. Shoot 4k Video on your iPhone but you can't watch it on your new Apple TV. Wow that is super lame. Getting this on day 1. Also, no Bluetooth 4.1 or 4.2? This MacWhiners used be my favourite website. They barely caught up with competition; very underwhelming update. But! That's the market. Speak with your money and enjoy it if you buy into it. Seriously though, there is no content that I am aware of that is 4K not to mention only a small percentage of users will even have a 4K TV. Add to that the enormous bandwidth needed to stream it and it's no wonder it doesn't have it.